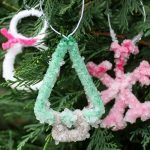 With cardboard, peanut butter, and birdseed, kids and adults can both make these easy birdseed ornaments garden craft. Spring is officially here, along with plenty of hungry birds. 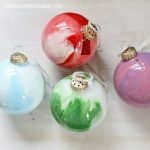 You and the kids can make these easy birdseed ornaments from just a few items that you probably already have in your home. 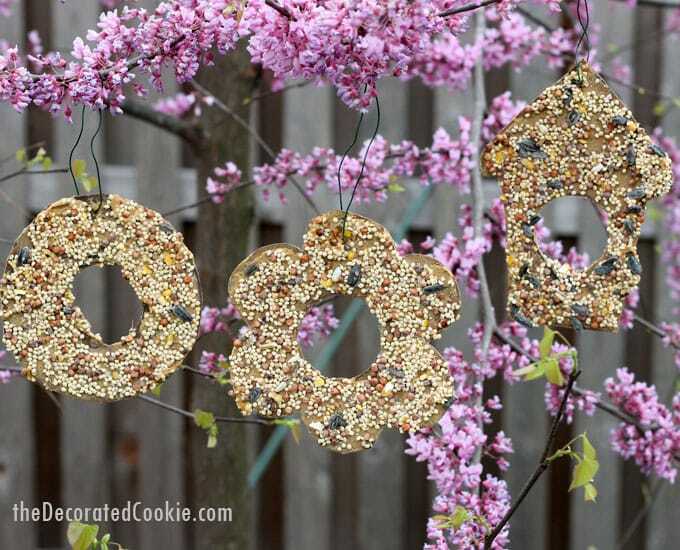 These birdseed ornaments are a fun and simple kid-friendly and bird-friendly craft. 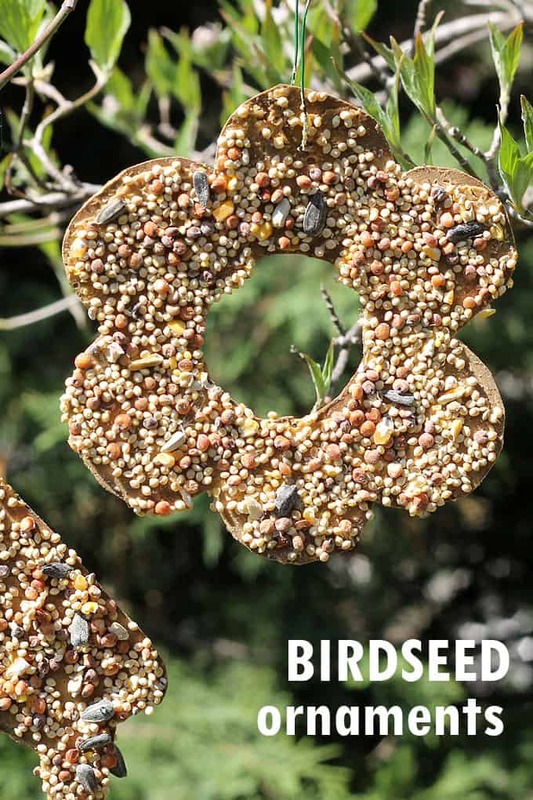 You can make your ornament any shape you like, just be sure to cut a circle in the center so the birds can perch while they dine on delicious birdseed. All you need is some thin cardboard, peanut butter (the Audubon Society assures us that peanut butter is safe for birds), and birdseed. 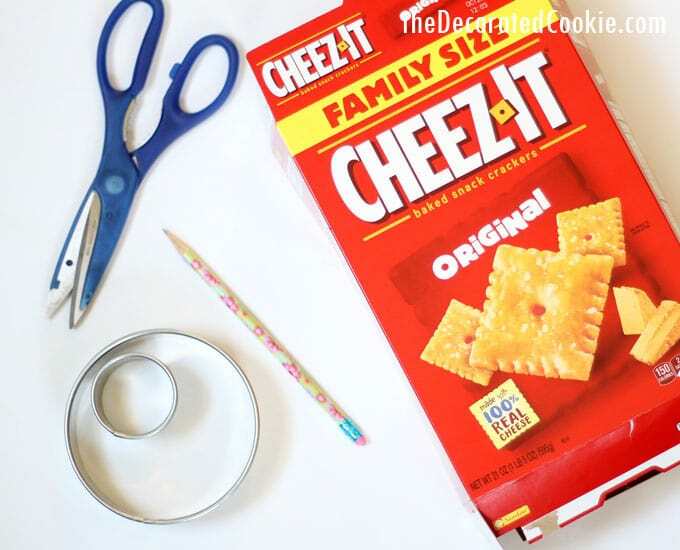 Flatten your cardboard and use a template or cookie cutters to draw any shape you like with a pencil. In the center, draw a circle about 1 1/2-inches in diameter. Cut out the shape and the inside circle. 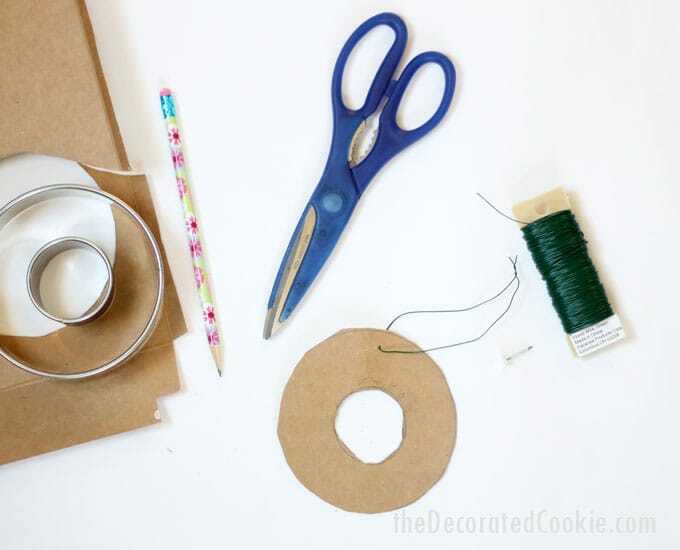 TIP: Adults can pierce the center with the nail or needle to help cut out the center. 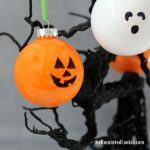 Use the nail or needle to poke a hole in the top of the shape (adults only). Thread a piece of floral wire through the hole and twist to close. 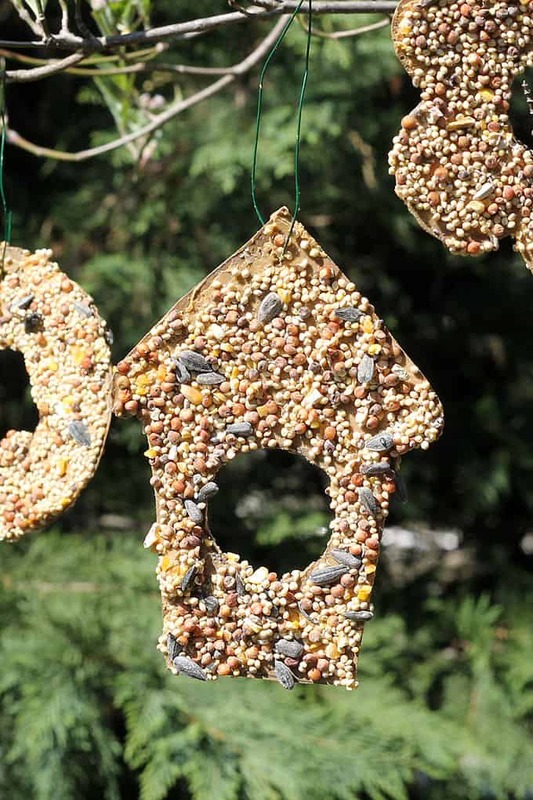 Pour some birdseed in a tray or dish. Spread a thin layer of peanut butter on the shape. Hold the shape over the tray and cover with birdseed. Turn over to remove excess. 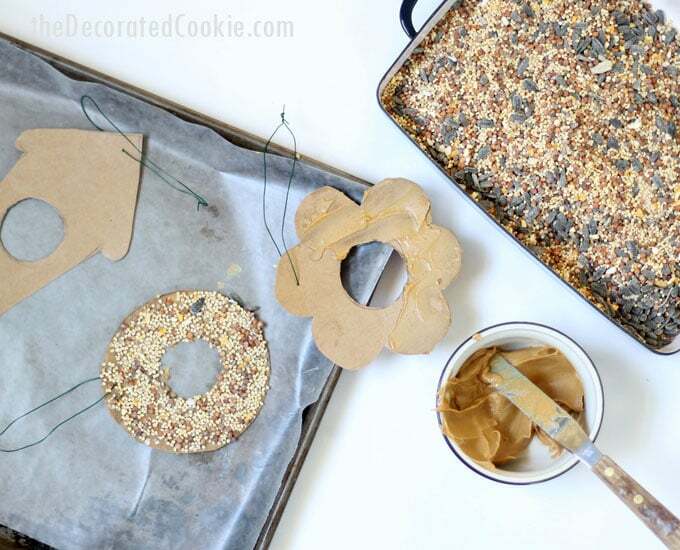 Place the ornament on a baking tray lined with wax paper to set. If desired, repeat on the other side (optional). Hang outside and wait for the birds! 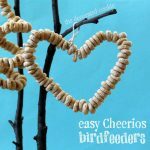 If you like this super easy craft for the birds, you might want to have the kids try these Cheerios birdfeeders next. 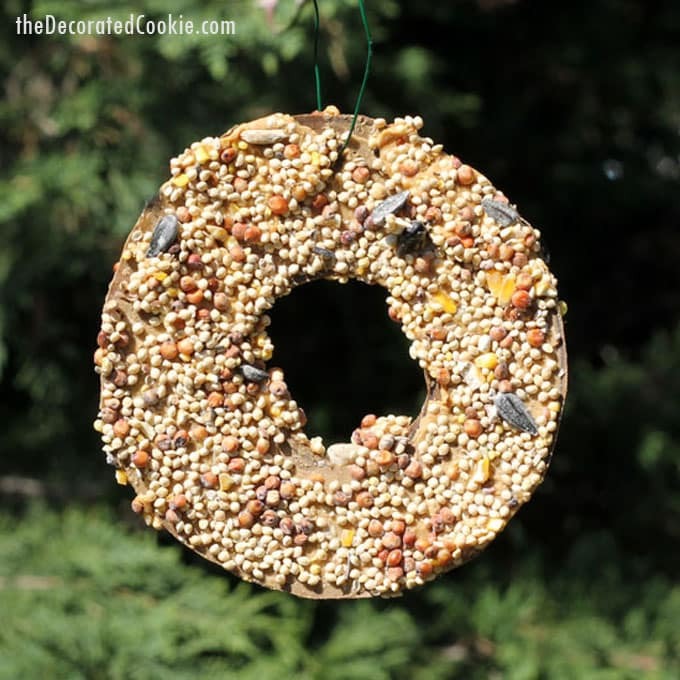 This post for easy birdseed ornaments also appears at Crafts by Amanda.